“Once you go, you know.” Have you seen or heard the commercials for Jamaica lately? Well believe them, they are ready for us. 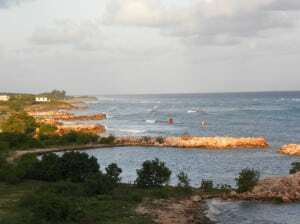 In Montego Bay, the turquoise blue waters of Jamaica captivate an idyllic island golf setting at the White Witch, Cinnamon Hill, Half Moon and Tryall Clubs.There is no vegetation depravation as the hilly jungles burst with exotic foliage, flowers and birds, framing the ocean views. Great House of long ago is a nearby tourist attraction. 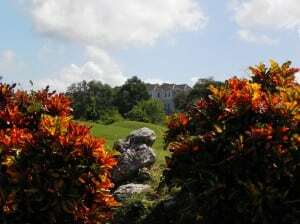 Cinnamon Hill Golf Course wraps around the historic Annie Palmer’s Rose Hall and journeys back into the mountainside where the famous number 15, par 3 waterfalls served as a backdrop in the James Bond film, “Live and Let Die”. What goes up must come down. The final holes are a quest to the sea, divided by streams and jungle, requiring cerebral skills, as addition becomes multiplicationwith errant shots. Hole 17 ends at the 18th-century aqueduct that separates the green from the #18 tee box. The finishing hole is a dogleg left around a large tree with bunkers guarding the right side. Big hitters can cut the corner for reduced yardage to an elevated green that is separated from the fairway by an imposing stream lining the entire left side before returning to the clubhouse. And the slaves all lived in fear to see a frown on Annie’s face. Are they sleeping ‘neath the palms beside the Caribbean Sea? Jamaica and drink it in. Blue Mou ntain coffee wakes you up, made with the purest water. Later Jamaican rum mixes with fresh juices. Coconut water sipped straight from the shell hydrates and boosts the circulatory system. The Iberostar Rose Hall Beach View The IBEROSTAR Rose Hall serves all the local flavors and international cuisine at their distinguished restaurants. The gourmet food is just a small part of this all-inclusive resort that delivers pristine beaches, extraordinary amenities, and a butler. Now if you are accustomed to a butler, you are all set. If you are thinking of Robert Guillaume in the sitcom “Benson”, then you are showing your age. If you are wondering, “What does the butler do?” then it will be even more fun! How about making sure the mini bar is stocked with your top shelf choices (yes, no charge), clothes ironed and baths drawn upon request? Don’t try to fill your own ice bucket or you will be in trouble. Lounge at the IBEROSTAR pools or beach, sunscreen provided. The water is so warm that sharks are never a threat. Row out on a kayak for a different view from the sea of the beach and mountains or take a catamaran into the breeze. If you have never sailed, a guide will teach you for $10. The “Star Friends” lead all kinds of activities like pool scuba lessons, aerobics, beach volleyball and more. Vacation days fly by with fun, peace and harmony. When the sun goes down, the excitement goes up with numerous entertainment venues for dancing, Broadway shows and musicals. Now, back to golf. 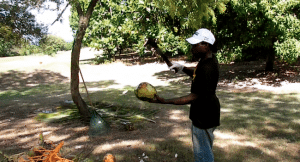 Legendary for its heritage and spectacular setting, the Tryall Club emulates the cultural influences of the sugar and coconut plant ations that permeate the islands past history. The 18th century waterwheel is still in working order and provides a unique tee box presentation as golfers guide their shots through the aqueduct that carries the water to the wheel. Built around the former plantation’s Georgian Great House in 1834, it stands as the focal point of one of the Caribbean’s finest golf venues. Developed in the ‘50s as a private villa resort by a group that included Governor John Connally of Texas and U.S. Senator Lloyd Bentsen, it became a world-renowned venue for golf and tennis, hosting the Johnnie Walker World Golf Championship beginning in 1995 and Davis Cup tennis matches. Today it is one of the most sought after vacation villa resorts in the Caribbean with 73 luxury estate villas and 13 Great House villas. Our Jamaica Tours driver Michael, gave us the cultural, economic, and language history of the island as he transported us from IBEROSTAR Rose Hall to the different courses, passing through town and the Hip Strip, famous for arguably the first Margaritaville restaurant on the water. A Jamaican with a passion for his island, he described the transformation of Jamaica into a unique and welcoming vacation spot. From the 1600’s, n umerous invasions of the island including the British, French, Spanish and pirates, formulated the culture, architecture, and language. Education is the current focal key to the future of its people. While English is the official language, a native Jamaican tongue prevails among the residents. 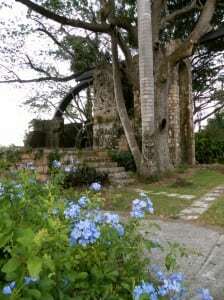 A combination of Spanish, African, and English with smaller influences of other Caribbean islands, it was initially developed as a way of confusing the plantation owners, then evolved into a culture of its own and has been presented for inclusion of the United Nations as a recognized and official language. So much history of strife and conflicts inspired the famous Bob Marley songs and push for “One Love.” The soft reggae beat permeates the culture reflecting an attitude of peace. Caddies and everyone you meet exhibit a happy, healthy contentment that is contagious. A mere ninety-minute flight from Miami transports to this island of happiness to golf, swim with the dolphins, hike to the waterfalls, snorkel, dive or lounge. No pressure, no problems, ya mon! Once you go, you know you must return for more. Our invitation came from IBEROSTAR and Tom Jaronski, President of The Golf Connection, LLC to participate in the Ja maica Invitational Pro-Am – “Annie’s Revenge”, played at White Witch and Cinnamon Hill. Tom leads a staff of tournament efficiency experts for a fun packed competitive event that we thoroughly recommend. Also upcoming in February, 24-28th is their Cancun Pro-Am at the IBEROSTAR Cancun on the Maya Riviera, another outstanding beach destination where everyone is a star. Check out both opportunities and more at http://www.thegolf-connection.com or http://www.iberostargolfevents.com. 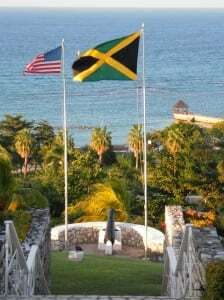 For all about Jamaica see http://www.visitjamaica.com.